On your Ranthambore wildlife tour, you can stay in Khem Vialls resort in Ranthambore which is a perfect wildlife place to spend your memorable holidays. 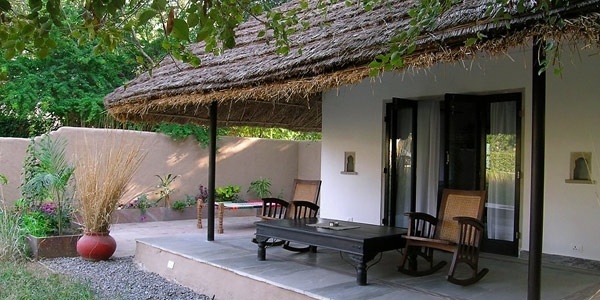 Khem Villas Resort located at in close of proximity of Ranthambore National Park. The resort extends over an area of 10 acres. It has turn into a home of wildlife. The resort has become very popular because of its exclusive wildlife life experience to the tourists and providing globally services. It is familiar to see hyenas, desert fox, hares and jackals etc. nearby the site grasslands. As the resort in front of the National park, some time you can have opportunity to see pug marks of different kind of wild animals, for example- sloth bear, hyenas, leopard and Tiger. There are small water bodies in the resort and its habitats of different type of birds create a paradise for keen bird watchers. The luxury camp is planned to provide tranquility and peace within its comfortable and very private ambiance. A Camp Khem villas is a perfect wildlife place in ranthambore that offers to guests a complete satisfaction and peace of mind during their stay. Khem Villas resort offers three different types of accommodation to the wildlife enthusiasts in 7 tents, 8 cottage and 4 rooms. All three lodging categories designed to keeping in mind that simply, luxurious and with definitive superiority. All accommodation is entirely outfitted with the modern amenities of luxurious living. The resort offers excellent facilities like air conditioned spacious cottage and room with attached bathroom, luxury tent accommodation that make your stay comfortable and memorable. Khem Villas provides delicious, vegetarian food from a range of world cuisines to the guests. If you are a non vegetarian then you will have to be disappointed, because the only vegetarian cuisine is served in Khem Villas, but in the resort you'll always be chary of the gigantic tropical forest and the thrilling of nature all around. Extra Bed Charges in all accommodation is Rs.5000 per person per night.